On October 3, 2018 a court temporarily stopped the U.S. Government from terminating Temporary Protected Status (TPS) for four countries: El Salvador, Haiti, Nicaragua and Sudan. This ruling means that, for now, people with TPS from those four countries can lawfully remain in the United Status. This is only a temporary decision, it is not permanent, which means, it can change at any time. The ruling does not impact the termination of TPS for Guinea, Liberia, Honduras, Nepal or Sierra Leone. As of January 2018, Temporary Protected Status (TPS) had been terminated for 7 countries: Guinea, Liberia, Sierra Leone, Sudan, Nicaragua, Haiti and El Salvador. The injunction from the California court stops the government from deporting protected immigrants from the countries of Sudan, Nicaragua, Haiti, and El Salvador while the case continues. The Judge prohibited the government from terminating TPS for these four countries pending the outcome of the litigation. This decision does not allow people from these countries who had not previously applied for TPS to apply for TPS now. On October 31, 2018 The Department of Homeland Security publicly stated that Nicaraguan and Sudanese TPS holders who re-registered during the last re-registration period for their country received an automatic extension of TPS until April 2, 2019. Nicaraguan and Sudanese TPS holders whose cases have already been approved and who have Employment Authorization Documents (“work permits”) set to expire will receive automatic extensions of their work authorization through April 2, 2019. Automatic extension of work authorization documents apply to TPS holders whose cases have already been approved by the United States Citizenship and Immigration Services (USCIS) as well as TPS holders with pending applications. More information about TPS for Haiti and El Salvador will be provided if the court case continues past the termination dates for Haiti (July 22, 2019) and El Salvador (September 9, 2019). Catholic Migration Services urges anyone who received TPS for Guinea, Liberia, Nepal, or Sierra Leone to call our office and schedule an appointment for a free legal consultation. The court case will continue, and there may eventually be a court decision or settlement that resolves whether TPS can be terminated, and if so, the circumstances for such termination. Until then, the U.S. government cannot terminate TPS for El Salvador, Haiti, Nicaragua and Sudan. If you are a TPS recipient for Guinea, Liberia, Nepal, or Sierra Leone and have questions or concerns, please call Catholic Migration Services in Brooklyn at (718) 236-3000 or in Queens at (347) 472-3500 for free legal advice about how this court decision may impact you. Our office hours are Monday through Friday between 9:00 a.m. and 5:00 p.m. For additional information, visit our website and follow us on social media via Facebook, Twitter, and Instagram @CMSBQ. 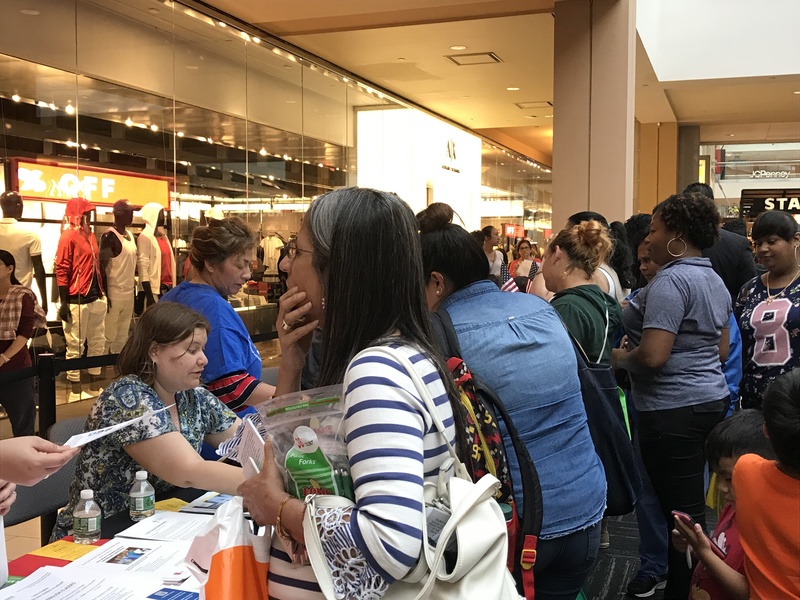 Queens Borough President Melinda Katz, District Attorney Richard Brown, and the Queens Immigration Task Force held their Annual Immigrant Know Your Rights Week Resource Fair and Legal Clinic on Thursday, June 28th at Queens Center Mall. 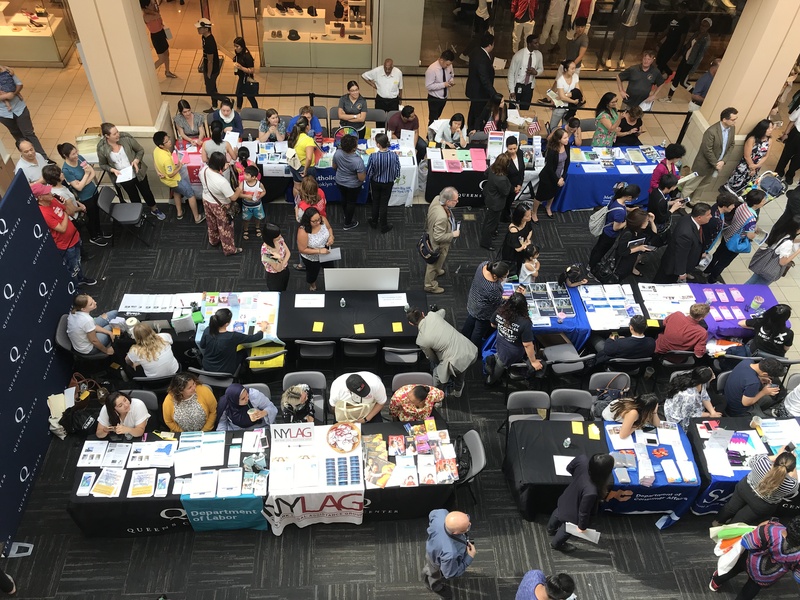 Over 30 organizations and agencies participated in the resource fair and connected Queens immigrants with information for city services, nonprofit organizations and advocacy groups. A free legal clinic provided confidential consultations in areas of immigration, housing, employment, and domestic violence. Attorneys from Catholic Migration Services were available for legal consultations and an outreach team informed New Yorkers about the organization’s legal services. Queens residents stop by the Immigrant Resource Fair for a chance to learn about new services, organizations, and agencies. Queens immigrants chat with the outreach team of Catholic Migration Services to learn about the legal services and know your rights education available through the organization. 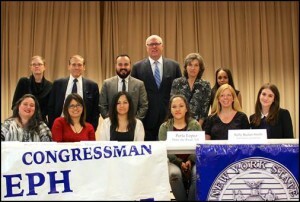 Queens Borough President Melinda Katz’s Immigration Task Force is organizing a series of free informational “Know Your Rights” workshops and confidential legal clinics for immigrants from June 25 to June 29 and Catholic Migration Services has partnered with with the Borough President to bring these much needed services to the community. Taking part in a resource fair and one-on-one consultations, immigrants are encouraged to attend, seek resources and legal advice on immigration, housing and workers’ rights. 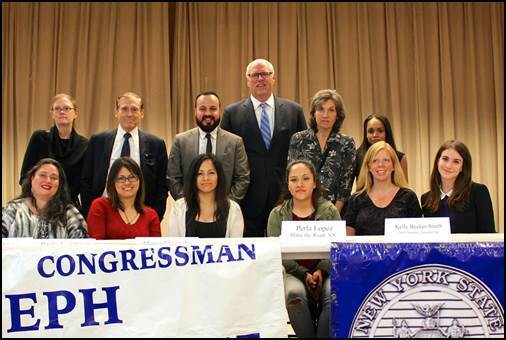 On Wednesday, April 8th, Joe Crowley, Vice Chair of the Democratic Caucus, and NYS Assembly Member Francisco Moya hosted an immigration forum in Jackson Heights, Queens. During this meeting leaders and experts on immigration discussed the status of President Obama’s executive action on immigration, the future of the NY DREAM Act, fraud prevention, the Central American Minors program, and different benefits and services available to immigrants in New York. This meeting provided members of the local community an opportunity to receive information and ask questions on the various programs that effect immigrants. CMS Immigration Counselor Marisol Canales was a member of the panel, she discussed CMS’ role in empowering immigrant communities and providing valuable resources and services. Other participating organizations included the American Immigration Lawyers Association, Legal Aid Society, SCO Family of Services, International Rescue Committee, Make the Road New York, Emerald Isle Immigration Center, FWD.us, Queens Community House, and CUNY Citizenship Now. New York State Senator Jose Peralta also joined the meeting held by Crowley and Moya. On October 28th 2014 CMS staff Frederik Stefani and Jennifer Park held a workshop at the Institute for Community Living (ICL) Family Resource Center in Brooklyn. CMS staff spoke to a small group of 10 people about various eligibility options for victims of crimes, such as the Violence against Women Act, U and T visas, and Gender-Based asylum. The Institute for Community Living (ICL) Family Resource Center is a community-based service provider that equips parents with the skills and tools to assist children who experience behavioral and emotional problems. CMS is developing our outreach and partnership efforts throughout Brooklyn and Queens to be more accessible to people out in the community.